Please see below for our latest news – we have been very busy as you will see. Welcome to our October newsletter. I arrived back in Kigali towards the end of September to be in time to help to organise the end of the school year celebrations. We have had a good year this year, the staff and children have worked very hard and I arrived to find everything progressing smoothly. 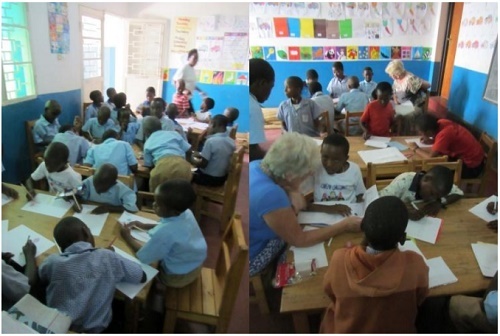 This year we decided to have two end – of – term meetings, one for the 180 Nursery children and one for the Primary children who are sponsored to attend local schools, along with other Primary children who attend our homework club, almost 200 children in all. We have grown a lot! We are now expert in organizing the day, the children organised the seating and we were ready to start on time. Many proud parents arrived to watch their children perform their songs and dances and to demonstrate what they have learnt and how well they speak English. After the performances the 5 children who earned the highest percentage marks in their end of term examinations received a small gift and the reports were given out to all the children. Our second celebration was held on Sunday October 27th. It was a full day. We began in the morning when all the children who have sponsors gathered to write letters to their sponsors and send copies of the end of year reports. As we have come to expect, the very large majority of our children achieved good marks over the year. The only measurement we have of their success is their position in class. The classes are often very large – up to 55 children. Of the 73 children who brought their reports, 42 are in the top ten in class, with five first, six second and two third places. Eighteen more are in the tenth to twentieth place, leaving thirteen below twentieth place. The staff, parents and children are all very proud of their achievements. The children have worked very hard at school and this day was to be their treat. Writing letters in English is a challenge for some, but hopefully their sponsors will see improvements as time passes. This year some of Primary 6, who are now very competent in English, helped out. My friends Penny and Carole were also drafted in to assist. The letters and reports are now in the UK and will be posted shortly. We all think this contact is so very important and we enjoy this time together. The children are very aware that this is their chance and that they might not otherwise be in school. Meanwhile things were very busy in the kitchen; it was all hands on deck to prepare a special meal for everyone. All the staff turned up to help, there were so many things to cook that we had to get out our old charcoal stoves. The children loved it and then had a short break before preparing for the afternoon. Parents, staff and children gathered in the afternoon, along with some special visitors to watch and participate in a programme of dancing, plays, poems and speeches to celebrate the achievements of the children and to say goodbye to the first Primary 6 children to leave us. They had taken the National Examinations in October and we will have to wait until the end of January to know the results. It is a nervous wait for us because their marks will decide the secondary school they can attend. One of the highlights for me was the dancing. Eric has been working very hard with the children; they practice three times during a week and twice during the weekend. The troupe is growing now as more children want to join and the person in charge of education for the sector was very impressed with the performances and congratulated us on our support for the traditional culture. They were supported by a choir of children and some of the women who make baskets at the project. They all looked resplendent in blue and yellow! In the second picture they are taking a break between performances and the third was taken at the end of the day. All the Primary classes performed something, songs, plays about the value of education and how much they all appreciated how fortunate they were to be in Meg Foundation. The women who had completed their course in Literacy and Numeracy were presented with their certificates which I know they will treasure. Later that week they returned with a gift for me, always a humbling experience because I know they are very poor people, but it shows just how much they appreciate the school. But the main purpose of the day was to say goodbye to the first students to leave Primary school this year. Some of them have been with me from the very beginning of my involvement with the project, so it was with mixed feelings that I listened to their very moving speech. They wrote it themselves and delivered it in first in Kinyarwanda and then in English. They are now very proficient in English; one of them translated my speech to the parents on that day. They are all in school this week helping Vincent with his holiday activities, translating and organising everything, helping out with the younger ones. It is traditional for the staff to recognize the efforts and achievements of Primary 6 children and our staff presented them all with a gift and I gave them an Oxford dictionary. They in their turn gave me a gift. We had a wonderful day, full of fun and laughter, sometimes emotional but everyone enjoyed it. The parents were very proud of their children. Thank you to everyone, not least Wilma for most of the photographs. So finally I leave you with some pictures which I hope you will enjoy. Thank you for supporting us, we cannot do this without you. Information about how to sponsor a child is on our website www.kinambaproject.org.uk – we will be happy to hear from you. On behalf of the people in Kinamba we wish you peace, good health and happiness. We know we are lovingly supported by friends in many corners of the world and we are very grateful.